What Does WYD Actually Mean? 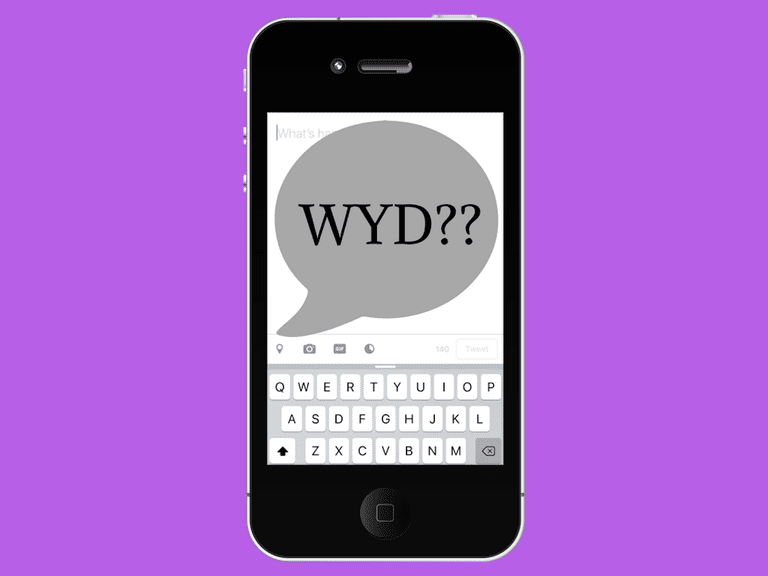 Have you ever received a text or chat message asking: "WYD?" If you're not familiar with the three letters that make up this particular acronym, you probably wouldn't know exactly how to respond. If we were to take proper grammatical use into account here, the correct way to ask this question would be, "what are you doing?" But since internet and smartphone users are known to trade proper use of grammar and spelling for speed and ease, taking a common question like this and leaving out a word turns it into text-friendly slang that sounds cool and casual. One of the most obvious ways people use WYD is by directing it as a question at somebody the exact same way they would in a real face-to-face conversation. It's typically used as a standalone question to either start a new conversation or to provide a segue from a topic in an ongoing conversation. Since WYD is a question most appropriately used in a real-time conversation focused on gathering information about the current moment, it's common to see it used in text messages or on instant messaging platforms. While you might see the odd "WYD?" question asked on Twitter, Facebook or any other social network, it's most useful in private, real-time conversations. An exception to the rule is when WYD is used hypothetically while commenting about an event or a situation. In this case, the use of WYD becomes part of a general statement rather than a question directed at somebody and may be more commonly seen in status updates as well as comments left on social networks. Friend #2: "Nm just chillin"
In the first example above, Friend #1 uses the acronym the way anyone might ask "what you doing?" or "what are you doing?" in a face-to-face conversation. Friend #1 is essentially trying to gather information from Friend #2, who responds with another acronym—"nm," which stands for "nothing much." Friend #1: "Wyd after school tomorrow?" Friend #2: "Prob going to the gym"
Although the acronym is often used as a standalone question, it can also be used as part of a longer question, as shown in the second example above. In this example, Friend #1 specifies that they want to know what Friend #2 is doing in the future after a specific time. "My bro used up all the tp this morning and then left before I woke up...wyd man that ain't cool"
In the third example above, we get to see how WYD can be used as a hypothetical question as part of a comment or statement about something. It's obvious that the person posting this status/comment or sending it as a message isn't directing the acronym as a question to someone as if looking for an answer. Instead, they're using it to express their own confusion and distaste about an event that took place. Some people might type WUD instead of WYD, which basically swaps out the Y for a U — although it still stands for the same word (you). It's unclear which acronym variation is more popular. If you plan on using one of these acronyms yourself, go with the one you think is easiest to interpret. WYM: What You Mean? This is the same as asking, "What do you mean?" WYS: What You Saying? This is the same as asking, "What are you saying?" and is typically synonymous with WYD in slang speak. WYO: What You On? This is the same as asking, "What are you on?" and again is usually synonymous with WYD or WYS in the slang world.